Born: August 3, 1772 in Falmouth Ma. 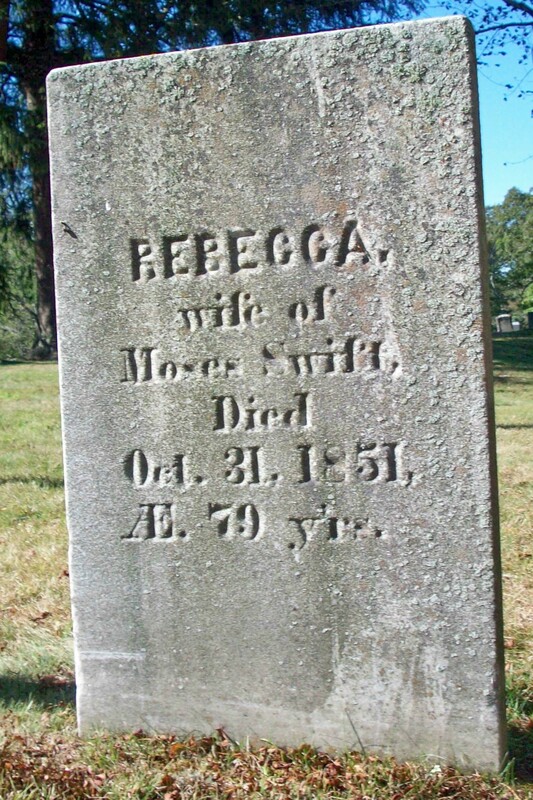 Died: October 31, 1851 in Sandwich Ma. at 79 yrs, 2 mos, 28 d.
1. Alden N. Swift; (October 15, 1791 – February 7, 1853); Married Abigail/Nabby P. Swift (1797 – 1869) (Clark Swift & Phebe Freeman) in int. November 11, 1820; Alden & Abigail/Nabby are buried in North Falmouth Cemetery. 2. James Swift; (September 7, 1793 – October 8, 1873); Married (1) Abigail Dimmick (1797 – 1824) (David Dimmick & Mercy Doane) in Sandwich Ma. on April 26, 1819 & married (2) Priscilla Benson Cowing (1797 – 1857) (Israel Cowing & Priscilla Dexter) in Rochester Ma. on March 25, 1826; James, Abigail & Priscilla are burried in Cataumet Cemetery. 3. Caroline Swift Ellis; (July 7, 1795 – May 21, 1829); Married Russell B. Ellis (1794 – 1868) (William Ellis, Capt. & Hepsibah Blackwell) in Sandwich Ma. 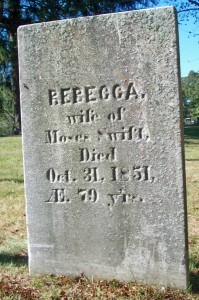 on June 1, 1815; Russell married (2) Susan C. (–) (1799 – 1876); Caroline is buried in Pine Grove Cemetery in Waterville Me. ; Russell & Susan are buried in New Jersey. 5. Hannah Swift Bourne; (December 6, 1798 – March 22, 1841); Married Nathan Bourne, Jr. (1788 – 1866) (Samuel Bourne & Mehitable (Bourne)) in Sandwich Ma. 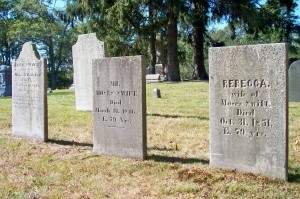 on September 6, 1821; Hannah & Nathan, Jr. are buried in Old Bourne Cemetery in Bourne Ma..
6. Lucy Swift; (September 9, 1800 – September 10, 1825); Lucy died at 25 yrs; She is buried in Cataumet Cemetery. 7. Nathan Barlow Swift; (October 7, 1802 – April 25, 1875); Married (1) Pamelia Cowing (1807 – 1860) (Israel Cowing & Priscilla Dexter) in Rochester Ma. on December 31, 1828 & married (2) Harriet Newell (Howes) Ellis Howes (1823 – ?) (Nathan Howes & Lydia Sears) in Sandwich Ma. on June 25, 1861; Harriet married (1) Anson Burgess Ellis (1813 – 1853) (Thomas Ellis & Rebecca Burgess) in int. March 4, 1843 & married (2) Lewis Howes, Jr. (1812 – ?) (Lewis Howes, Capt. & Lydia Berry) in Sandwich Ma. on August 23, 1859; Nathan & Pamelia are burried in Cataumet Cemetery. 8. Betsey F. Swift Greene; (October 10, 1804 – December 14, 1884); Married Zebedee Greene (1800 – 1877) (Barnabas Green & Judith Caswell) in int. October 6, 1827; They had 4 children; Zebedee & their daughter Elizabeth Freeman Greene are buried in Cataumet Cemetery. 9. Mary Swift Howard Redding; (January 5, 1806 – October 11, 1864); Married (1) Charles Ellis Howard (1802 – 1840) (Calvin Howard & Chloe Fuller) in int. July 25, 1829 & married (2) Calvin Redding (1815 – 1878) (Calvin Redding & Lucy (Hall) Morse) in Sandwich Ma. on May 22, 1850; Mary, Charles & Calvin are buried in Cataumet Cemetery. 10. Phebe Nye Swift Douglass; (April 19, 1809 – October 11, 1886); Married Barnabas Nye Douglass (1791 – 1873) (George Douglass & Patience Savory) on September 14, 1828; Phebe & Barnabas raised a family in Rochester Ma. & they are buried in Sherman Cemetery in Rochester. 11. Waymon Spooner Swift; (November 3, 1812 – April 17, 1899); Married (1) Lucy Freeman Swift (1821 – 1856) (Abraham/Abram Swift & Olive Lawrence) in Falmouth Ma. on January 18, 1842 & married (2) Maloney A. Jenkins (Alden F. Jenkins & Caroline E. Price) in Sandwich Ma. on June 12, 1857 & married (3) Emily W. (Mecarta) Baker (1847 – ?) (Orrin Small Mecarta & Melissa/Fanny Eldridge) in Sandwich Ma. on July 5, 1874; Emily married (1) Lewis Baker, married (3) unknown & married (4) Seth H. Rogers (Abt.1838 – ?) (Seth Rogers & Eliza Higgins) in Harwich Ma. on November 27, 1900; Waymon, Lucy & Maloney are buried in Cataumet Cemetery.